Organizing for America is a complicated beast, and my story yesterday couldn’t quite contain some of the interesting things about it. For all the activism geeks out there, here are some outtakes. About elections: OFA doesn’t just exist to push the administration’s agenda. If all of its issue campaigns failed, OFA would still serve the purpose of keeping volunteers engaged so they’re ready to help in 2012. 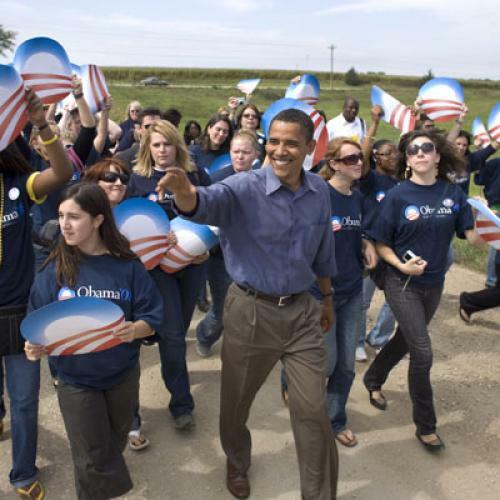 "In '04, if you opened your door, it was a paid staffer coming to your door,” OFA deputy director Jeremy Bird told me. “A paid staffer who left on election day, and they weren't coming back. They had the expertise, they knew how to print the list. In 2008, the person who came to your door lived in your neighborhood, and they weren't leaving after the election." Meanwhile, though, OFA hasn’t been much help in the two gubernatorial races—they just started sending mass emails to coordinate canvassing in Virginia in mid-October, and in early October, weren’t helping in New Jersey at all. “I wish they were, but they're not,” New Jersey Democratic Party chair Robert Angelo told me. About the 50-state-strategy: Remember former DNC chair Howard Dean’s plan to build up power on the ground level? He spent millions to hire three to five staffers to bulk up each state party, which paid dividends for Obama in 2008. Now, only a very few of those remain. The state party chairs I talked to were happy enough to have OFA people replace the Dean-era positions (the most OFA people in any given state right now is 12, in Texas). But the difference is that OFA people are there to push the President’s issue agenda, while the Dean people were supposed to elect Democrats on the state and local level.